The road to VPS100 took many turns in our long and extensive evaluation of topologies, materials, design and implementation. Usually RIAA equalizer circuits are implemented with capacitors and resistors (CR networks). Capacitors present the so called “dielectric absorption” - energy is stored in the dielectric material and is added to the signal with a small delay producing a ringing character in fundamental notes. This ringing behavior can be noticed in piano notes. In the past an alternative way of implementing a RIAA equalizer the LCR (Inductance-capacitance-resistance) circuit was proposed. A long time ago TANGO transformers from Japan used to produce such a circuit working in 600 Ohms. 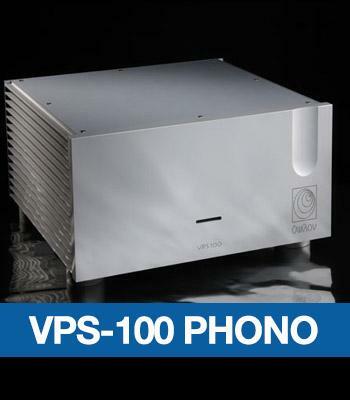 A few manufacturers are using LCR based phono stages using variations of the original TANGO LCR circuit. The challenge in 600 Ohm LCR eq is to drive the network properly; having no more than 2 gain stages with enough overall gain and low enough output impedance. The LCR networks most commonly used are based in double T filter networks. One T filter forms the 50-500 Hz poles and the second T filter forms the 2123 Hz pole. In the VPS100 we took it one step further, the 2123 Hz pole is formed by air core inductor with practically no stray capacitance at the first gain stage and the 50-500 Hz poles are formed in high signal level directly at the output of the second gain stage. So this is a split RIAA design using two gain stages based on the SIEMENS C3g tube. These tubes are very reliable as they are specified for 10,000 hours. The power supply uses the 6CA4 tube rectifier and a choke filter. The heaters for the tubes are AC in the second stage and DC passive regulated for the first stage. The construction uses no printed circuit boards and is point to point silver wired using our own extruded and annealed to spec silver wire. Special attention is paid to mechanically de-couple the first gain stage and 2123 pole coils using a specially designed decoupling system. "The Ypsilon produced an absolutely intoxicating blend of stupefyingly extended high frequencies, resolution, clarity, and transient precision, along with tight, deep, nimble, nonmechancial bass, and an ideally rich-ie, not too rich-midrange with just the right amounts of body and harmonic structure". "I heard the high-frequency clarity, air, and extension of the best solid-state phono preamps, as well as the harmonic expression and musical flow of the best tube phono preamps, with none of the negatives of either". Stereophile Product Of The Year: "Editors Choice"
"I haven't got over the Ypsilon and I don't expect to for some time. If ever".